Last week, I ran 13.1 miles on the spur of the moment and did it at a fairly decent pace of 11:02 per mile for a total time of 2:24:30. I had 11.5 miles scheduled for today. 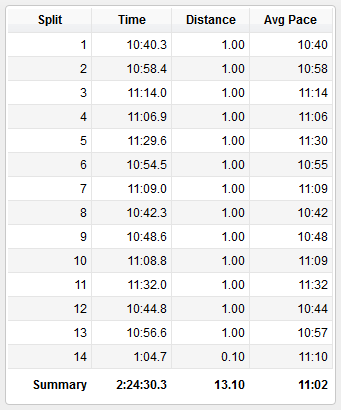 However, I wanted to go ahead and do 13.1 again. I brought 3 gels with me so I could properly fuel as I ran. I ate my usual 2 servings of shot bloks at the start of my run, then ate a gel at 3.25 miles, again at 6.25 miles and then at 9 miles. 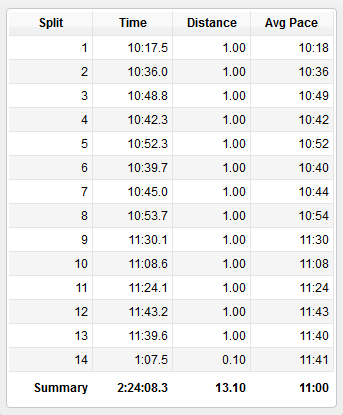 For the first 8 miles, I kept my pace under 11 minutes per mile. After that, I sort of lost my steam. Of course I did, I was cruising at a pretty good clip for those first 8 miles. But, I never dropped below my slowest limit of 12 minutes per mile. 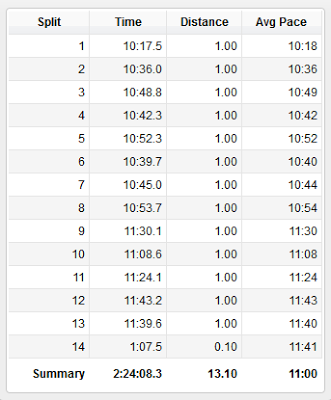 Anyway, I cut my average pace per mile by 2 seconds today for a nice, flat 11 minutes per mile, therefore cutting my overall time down by 22 seconds for a total time of 2:24:08. Woohoo! My biggest advice is to slow down on your long runs at the start. Work on getting your splits tighter, which means slower at the start and faster at the end, so that all your mile times are within about 15-30 seconds. If any miles are more than a minute faster than your slowest mile, make sure the fastest ones are toward the end. It will pay dividends later. yea, i know about reining myself in at the beginning of my long runs, it's just that sometimes my body just plain doesn't want to slow down, which is what happened here. but, yea, i need to try to keep my long runs at 10:20 at the fastest for now...until i can pick up the pace, which will happen over time.